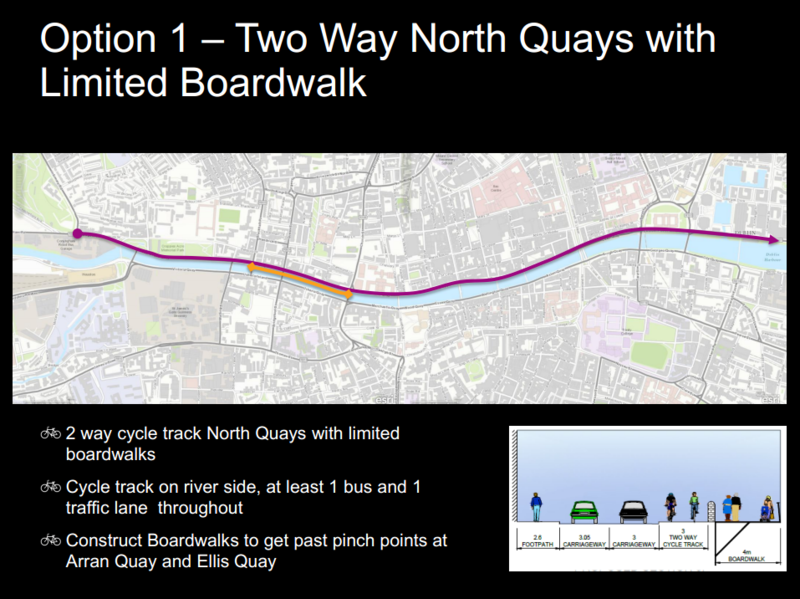 SECTIONS OF DUBLIN’S quays could be turned into segregated cycle paths under a new plan from Dublin City Council. This could see the space for car or bus traffic for the stretch from Heuston Station to the 3Arena reduced under some of the proposals. These range from converting the footpath in some sections to a two-way cycle lane, diverting buses, and the construction of a new boardwalk along the Liffey for pedestrians. Another would see one dedicated lane on the North Quay, and another on the South. However, the plans are still a long way from coming to fruition. They are due to be formally presented to the elected council in March, after which a non-statutory public consultation process will take place. The preferred option will then be voted on by council, with another consultation process following. It could be two years before work commences, provided the planning hurdles are passed. A council spokesperson said it is part of plans to introduce segregated cycle paths, similar to that already in place on the canals, across the city. Bicycle traffic has grown in the city over the past decade. The presentation today highlighted dangerous conditions for cyclists along the quays, but noted the value of the high density of tourist destinations along the proposed routes. These are the four proposed options. Email “Dublin's quays could be getting segregated cycle lanes”. Feedback on “Dublin's quays could be getting segregated cycle lanes”.